A tall crop of poplar trees was recently harvested as part of a bioenergy research project near Jefferson, OR. This was the second harvest of the 85-acre bioenergy farm, which is one of four AHB sites managed by GreenWood, with grant support from USDA National Institute of Food and Agriculture. 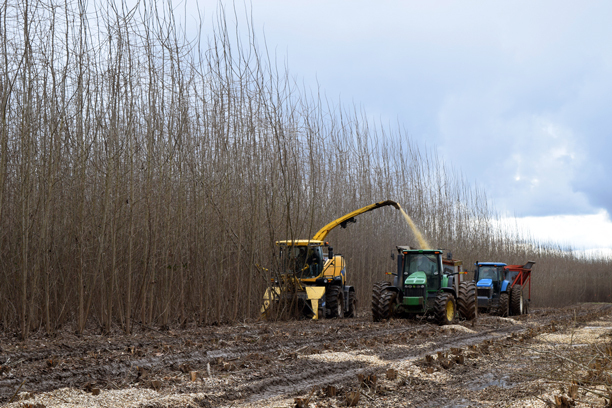 Each farm was planted with several distinct hybrid poplar varieties in 2012/2013 at a density of 1452 trees per acre. The trees were initially harvested in 2013 after two growing seasons, and they regenerated by sprouting from the cut poplar stalk (in silviculture, this is called coppicing). Ninety-four percent of the trees survived the three post-harvest growing seasons. An inventory of the 11 varieties grown at Jefferson showed an average yield of 40.0 bone dry metric tons of biomass per hectare after those three years. The most vigorous variety yielded 36% more biomass (54.3 dry metric tons per hectare), reached 36 feet tall on average, and grew to a maximum of 5.5 inches wide at the base of the stem. 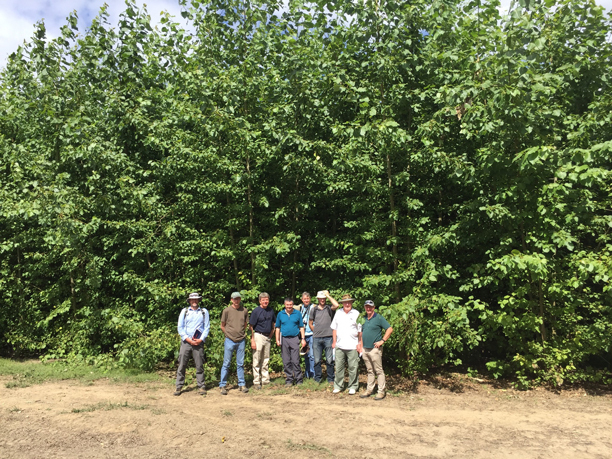 After being harvested in 2013, some of the hybrid poplar trees in Jefferson, OR grew to over 30 feet by the summer of 2016. “The growth of the Jefferson trees in three years is really impressive, proving we can produce the biomass the refineries are going to need to make the future renewable fuels industry a reality,” noted Gary Gressett, GreenWood field foreman. The harvester machine, a New Holland forage harvester fitted with a coppice header, was provided by the State University of New York, College of Environmental Science and Forestry (SUNY ESF). GreenWood collaborates with SUNY ESF to study the efficiency and logistics with which woody energy crops – specifically poplar and willow trees– can be cut, chipped, and delivered to refineries and boiler plants. This machine has worked successfully with willow in New York, willow in northern Europe, and eucalyptus in Brazil. A New Holland FR 9080 forage harvester fitted with a 130 FB coppice header cuts and chips its way through a stand of hybrid poplar in Jefferson, Oregon. Several farm wagons drive alongside and collect the chips, alternating between delivering and amassing the chips so the harvester can run continuously. The New Holland harvester cuts, feeds, and chips the trees all in one pass, and then blows the chips through a spout into a tractor-pulled farm wagon. Under optimum operating conditions, the harvester can cut trees while moving at 4 miles per hour and collect 60 dry metric tons per hour. During this Jefferson harvest, exceedingly wet ground conditions prevented the machine from working at full capacity. The cutting operation was also slowed by the trees themselves, which had grown so much that they frequently failed to fall cleanly to the ground for efficient feeding into the harvester’s chipping unit. 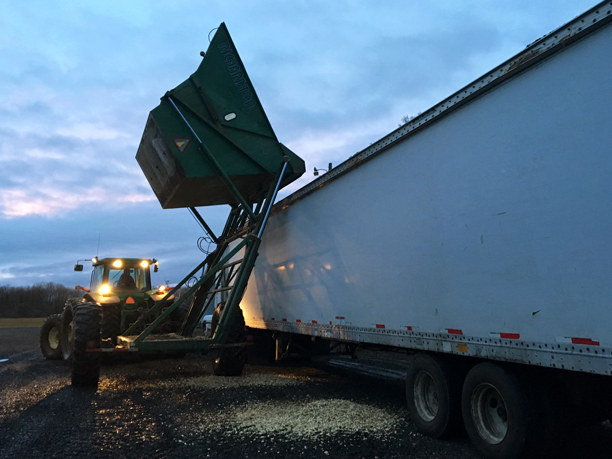 Seventy-three green (i.e., un-dried) metric tons of biomass were delivered to the biorefinery in Boardman, Oregon operated by ZeaChem, AHB’s conversion partner. ZeaChem is conducting trials to optimize the conversion of this new feedstock into biofuels at a semi-commercial scale. Scientists at University of Washington will conduct in-depth research to determine which clones perform best in conversion to fuels and chemicals. UW will also be doing compositional analyses of biomass from the sample in their pretreatment lab. Farm wagons filled with hybrid poplar biomass are towed to the Jefferson farm gate where they transfer their loads into chip vans. The load pictured here was delivered to Zeachem’s biorefinery in Boardman, Oregon. Idaho National Laboratory, operated by the U.S. Department of Energy, is receiving 20 green metric tons of poplar chips to study: (a) the process of converting the biomass into pellets, (b) the calorific content of the pellets, and (c) the energy required to produce the pellets. Idaho National Lab will also analyze the particle size-distribution of the biomass and develop a full chemical profile of the sugar, protein, ash, extractive and lignin components used in making pellets. GreenWood is consulting with New Holland engineers on ways to improve the harvester’s performance including modifications that will allow the trees to feed more easily from the saws into the chippers. “We are excited to partner with AHB on this project to improve the efficiency of harvesting systems for short rotation woody crops while maintaining and improving the quality of the biomass being produced,” says Tim Volk, Senior Research Associate on the faculty at SUNY ESF. The Jefferson harvest is being completed as modifications are implemented. Following that, a late April harvest of the AHB poplar demonstration farm in Hayden, Idaho is planned.